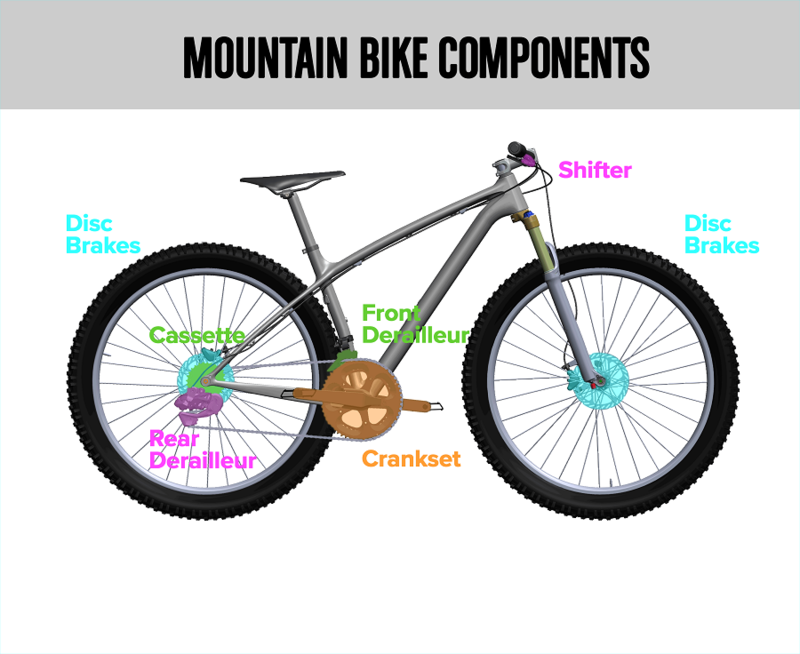 When shopping for a bike, you’ll see lists of the components your bike will come with. 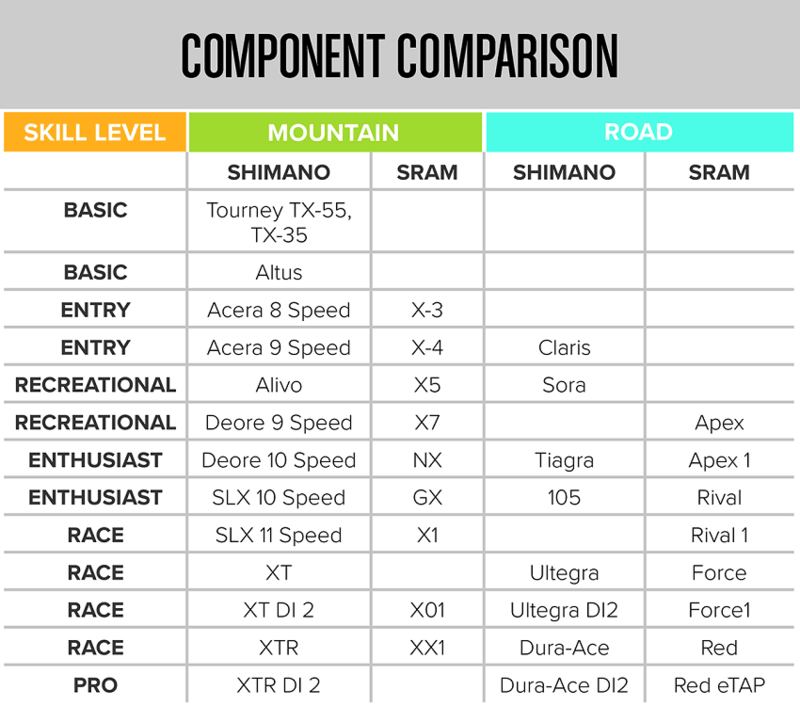 You can use the information and component comparison sheet below to see how they stack up for the type of riding you want to do and the performance you want out of your bike. A derailleur is a simple machine that moves the chain onto different gears. When it works well it is a seamless part of ride. Almost all work the same, being pulled by a derailleur cable at a fine tuned ratio. Shimano and SRAM are some of the best component manufactures available. They work similarly but often you will see shiftter and derailleurs match in brand and in speeds. Bikes have one, two, or three front chain rings, also known as the crankset. A bike with two chain rings is called a double. A bike with three chain rings is called a triple. Single chain rings or 1x cranksets were first introduced on mountain bikes but have spread to all types of bikes. More isn’t always better and 1x cranksets are rapidly setting the standard and often are considered a higher end spec on bikes. Each chain ring has a number of teeth on it where the chain connects. 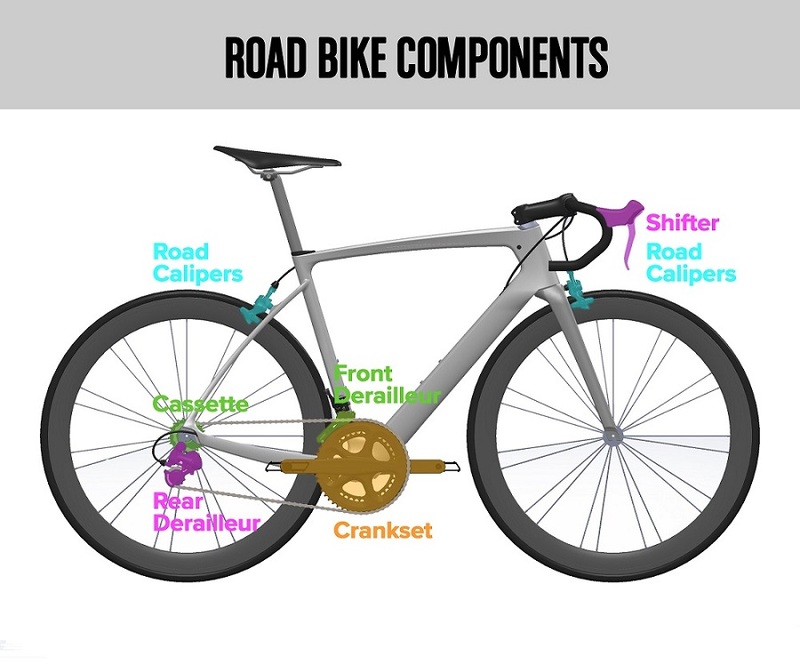 Your bike’s rear cassette is the stack of gears mounted on the right-hand side of your rear wheel. The range of cogs is measured as a comparison from small to high. Gear ranges are dependent on the number of chain rings on the crankset and can range from 11-28t to 10-42t with wider ranges often found on mountain bikes with 1x cranksets. 11 speed cassettes have become a standard for performance and are often used with 1x cranksets. Shifters let you move the chain between your front chain rings and the cogs of your bike’s rear cassette. Each shifter controls one cable attached to one derailleur. On road bikes, the shifters are mounted either flat or on drop bars. On drop bars they’re integrated with the brake levers. Integrated shifters make shifters and brakes easy to reach and in your field of vision, so you don’t have to take your eyes off the road to shift. Electronic shifters: Instead of cables, electronic shifters use wires and a battery powers the shifting. It’s more like clicking a mouse than pressing a lever. The system needs to be charged to work, and is a great investment for racers and professional riders. With electronic shifting, the chain will always move precisely and shift properly. You can shift on hills, even with pressure on the pedals. On mountain bikes, the shifters are mounted on the handlebar and will have thumb shifters. City bikes come with either thumb shifters of Grip shifters. Grip shifters let you switch gears by twisting the indexed grips. Rim brakes are attached to the fork and frame. Rubber brake pads push against the rim using friction to slow down. There are 2 basic types of rim brakes. 1. V-Brakes (also called linear pull brakes) are most common on Basic to Entry mountain and city bikes. The have two long levers with a cable across the top. That mount by two bolts to the fork legs or frame. 2. Road Calipers are a horseshoe shaped brakes found on some road bikes. They are connected to by a single bolt to the fork or the seat stay bridge on the frame. Disc Brakes were first introduced on mountain bikes and have moved their way to city and road bikes. They work like a car or motorcycle’s brakes, using friction from a brake pad that squeezes a metal rotor. Disc brakes are the most powerful type of brake and are less affected by weather. There are two basic types of disc brakes. 1. Mechanical Disc Brakes use a cable to actuate the brake caliper body. If you follow the brake line to the caliper body there will be exposed brake cable that affixes with a bolt. Mechanical disc brakes have more power than rim brakes and are easy to tune. 2. Hydraulic Disc Brakes have a hose that attaches from the brake lever to the caliper. It is filled with a fluid (DOT 5 or mineral oil) that activates pistons forcing the brake to close on the rotor. Hydraulic brakes are the most powerful of all brakes. They do require advanced maintenance skills and tools to fully tune. Rotors are the metal discs found at the center of the wheel. The bigger the rotor, the more leverage your brake has on the wheel and the faster it can stop it. Each 20mm increase in size roughly equates to 15 percent increase in power. Rotors range in size from 140mm to 203mm. As your drivetrain components go up in price, they typically get lighter and more precise in their performance. If you’re considering which components are most important and that give your biggest bang for the buck, look at investing in higher quality shifters and derailleurs. Even moving up one componentry level can make a big difference in overall performance of your new bike. For other components, moving up in price mostly means they will be lighter in weight.